I wrote this story for the Dallas Morning News. It was published on July 30, 2005. 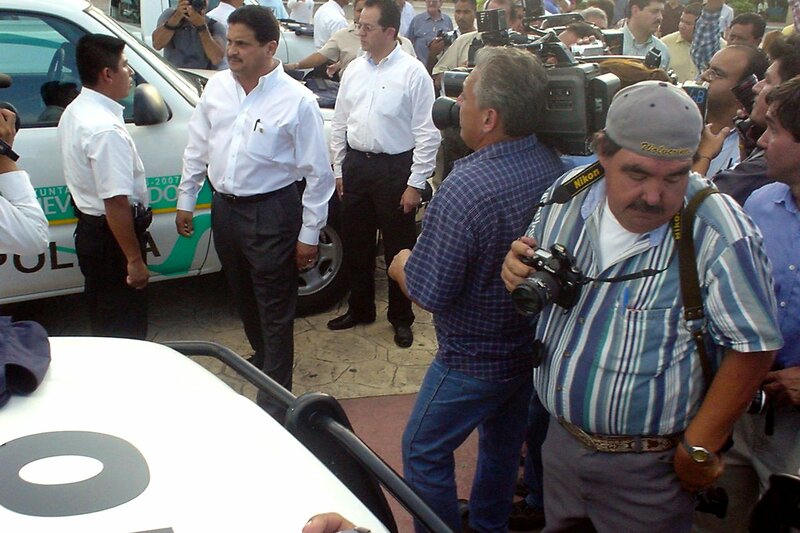 It’s about Omar Pimentel, who was chief of police in Nuevo Laredo, Mexico, before his disappearance in 2006. NUEVO LAREDO, Mexico – After seeing eight officers murdered during his first 15 days on the job, Police Chief Omar Pimentel has adopted a Gandhi-like approach to law enforcement. And who could blame him? Nuevo Laredo is one of the most dangerous towns for police in the Western Hemisphere, and he is the top lawman. Gunmen in the crime-ridden border town have slain 17 current and former police officers since Jan. 1. Chief Pimentel’s predecessor, Alejandro Domínguez, 52, who had vowed to clamp down on organized crime, was gunned down less than seven hours after becoming police chief on June 8. Hoping to avoid a similar fate, Mr. Pimentel, 37, is taking a more conciliatory approach, telling his officers to ignore the drug trade and concentrate instead on safeguarding life and property. By law, city police in Mexico aren’t responsible for investigating drug crimes, but many officers along the border find themselves drawn to the lucrative smuggling business. A few days after unknown assailants killed Mr. Domínguez, municipal police shot at federal agents who came to investigate, federal police said. Backed by the military, federal police then suspended the entire city police department and took their guns. Mr. Pimentel, a former pharmaceuticals salesman and ex-state trooper, took charge on July 6 and has the unenviable task of trying to rebuild the department. A much-reduced force of 120 returned to the streets this week, down from more than 700 officers before the housecleaning. Plans are to rebuild to a force of about 460. Internet bloggers have been guessing how long Mr. Pimentel will last. “I’ll give him 3 weeks,” said a blogger named cripplecreek. “Las Vegas odds give him 1:9 of surviving the week,” said another. Taking such remarks in stride, Mr. Pimentel declared that the municipal police were back in business Tuesdayin this city of 400,000. At a media event that day, officers climbed into shiny new patrol cars and turned on their sirens, drowning out an upbeat promotional jingle about the city. Mr. Pimentel and Mayor Daniel Peña Treviño waved white flags as the police cruisers hit the streets. Mr. Peña, 50, said the flags symbolized purity, but residents joked that the event looked like a surrender, a plea for the bad guys to stop targeting police. So far this year, assailants have slain 14 municipal police employees: Chief Domínguez, seven commanders, one supervisor, one coordinator and four officers. One ex-city cop and two state officers have also been slain, and three municipal officers have gone missing this year, colleagues said. A U.S. agent who investigates Mexican organized crime said he found it telling that eight of the officers were killed in July despite the presence of more than 300 federal police reinforcements. Speaking on condition of anonymity, he said he couldn’t help but suspect that Mexican federal agents had something to do with the killings. Mexican agents scoff at such theories and deny involvement in the murders. Whatever the case, graffiti touting a Sinaloa state trafficker named Joaquín “El Chapo” Guzmán have begun to appear in Nuevo Laredo. Some U.S. investigators said it could be a sign that Mr. Guzmán may be gaining the upper hand over the town’s violent hometown smugglers, led by the jailed Osiel Cardenas. Nuevo Laredo officials wouldn’t discuss the question, saying that such speculation could be dangerous. 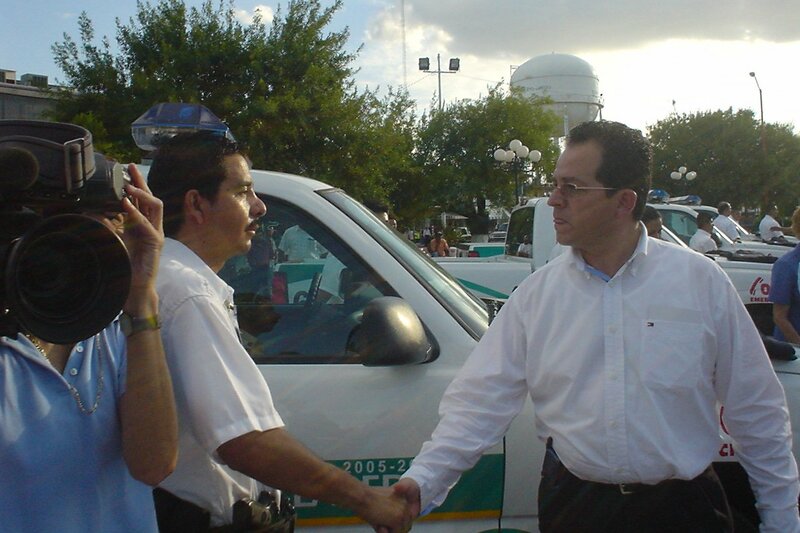 Mayor Peña conceded that city police face nearly impossible challenges. “If a police officer refuses to help the drug traffickers, he can be killed. But if he agrees to help, he can be killed by a rival gang,” the mayor said. On the U.S. side of the border, Juan Rivera, a spokesman for the Laredo Police Department, said he couldn’t comment on the chief’s decision to steer clear of drug crimes. Mr. Pimentel said he’s counting on financial incentives to keep his officers loyal. He wants to increase monthly salaries from $660 to about $850. He also plans to offer scholarships to the children of police officers, and homemaking and mechanics classes to spouses. And he said his department will help officers arrange financing so they can buy homes and cars. He said he knows that drug gangs have more money than City Hall, but he believes that giving officers’ families a stake in the department will help ward off corruption. And he said he’s confident his anti-crime philosophy will spread as citizens get more involved. Roy Godson, a Georgetown University professor who has been working with Mexican education leaders to develop anti-crime programs, said it’s too early to say whether Mr. Pimentel will succeed. Meanwhile, Nuevo Laredo officers complain that drug traffickers have them outgunned and outmanned. In the police department parking lot, officers drink their morning coffee just a few steps from the battered vehicles of their slain colleagues. The remnants include an Oldsmobile Alero, a Grand Cherokee Laredo, a red Mustang GT, a Ford F150 Lariat and a 1995 Ford Windstar. All bear the telltale signs of a horrific execution: splattered blood, shattered glass, sometimes a tooth or a bone fragment, and a cluster of bullet holes, usually arranged in a tight pattern over the spot where the driver once sat. One of the newest cars on the lot is a Nissan Maxima GXE. Unknown assailants sprayed it with gunfire at 7:40 a.m. on July 20. Hit more than a dozen times, Police Cmdr. Ricardo Uvalle got out and tried to run, police said. But he quickly collapsed to the pavement, mortally wounded. And now his Nissan sits abandoned, a pair of sunglasses and some diapers on the back seat. Nearby, vendors hawked afternoon newspapers detailing the city’s 104th murder this year, the throat slashing of an unidentified man. Back inside police headquarters, Mr. Pimentel signed a stack of credentials that his newly screened officers will carry. He said he leaves his desk only to make trips to City Hall and has assigned all day-to-day police operations to his second-in-command, 36-year veteran Mario Enrique Moreno. Just then his cellphone rang. He flipped open the device and glanced at a photo of his young son on the phone’s tiny screen. Mr. Pimentel, who moves around town with six armed bodyguards, has two other children besides his son, and his wife is expecting a baby. He said well wishers living as far away as New York and Florida have sent him letters telling him they are praying he will not be harmed. But he said he’s at peace with his perilous mission. Staff writer Alfredo Corchado in Nuevo Laredo contributed to this report.